It has something to do with (sleek, futuristic) planes. 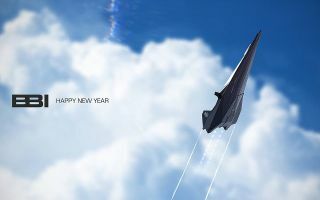 New Year is apparently the time for teasing your fans with images possibly related to your next game, and Homeworld: Deserts of Kharak developer Blackbird Interactive got in on the fun with a few pictures posted to its Facebook page. Contrary to the outer space-set original Homeworld games, and their planetbound prequel Deserts of Kharak, the three images show some sleek futuristic planes doing their thing in...the sky. Homeworld: Skies of Kharak confirmed? Maybe! Or perhaps it's something totally different (although the planes wouldn't look out of place in the Homeworld universe). A few Facebook users noted the similarity of the skull motif to that used by the Skull Squadron in Robotech/Macross, but as a developer laughed that off in a reply, and as it's a bit out of leftfield, it seems an unlikely explanation. I don't have any answers I'm afraid, although the most likely, I reckon, is a spot of DLC for Deserts of Kharak. Speaking of which, Rob Zacny liked that a whole lot when he reviewed it around this time last year.